What should you do with the rest of a hard drive after you've swiped the magnet? Here is a cool idea from Mike's Electric Stuff! The concept is that a permanent magnet is repelled by a rapidly spinning disc of conductive metal. The procedure is to open an old hard drive cover, exposing the platters inside but leaving the controller card connected. Take a scrap 5.25-inch hard disk, but one which still spins when you power it up (This may work with 3.5-inch drives, but the magnet tends to be attracted towards the motor shaft, so 5.25-inch drives allow the magnet to be further away). Plug it into a PC power supply -- no computer or anything else! Just the power supply and the hard drive. The drive will spin, at least for a few minutes. You may find that it spins down after a few seconds as it can't read any data from the disk (well you'd have trouble reading too if someone had ripped your head off!). Optional, but something to improve flying height: Remove the platters and spacers from the motor shaft, and re-assemble them so that all the platters are at the top of the shaft, with all the spacers at the bottom, giving a nice thick stack of aluminium. Tape a neodyminum magnet to the end of a strip of plastic or paper. The reson for using a strip, rather than, say, a string, is that the magnet tends to pull towards the centre and also tumble over - the strip constrains the magnet's movement to upwards only. Fix the strip to one of the side holes of the drive chassis, so the magnet rests on the disc surface, near the outer edge, as shown below. 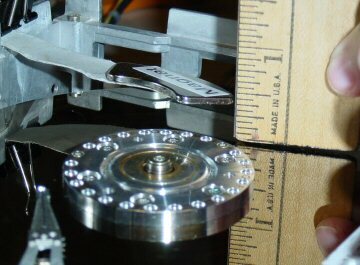 When the drive is powered up, the magnet levitates to about half an inch above the disc surface. Pressing the magnet down slows the disc rotation substantially. It might even cause your controller to detect a speed fault and stop the drive. The principle is that the magnet induces eddy currents in the platter. Most driver platters are polished aluminum. Some new drives use ceramic platter, and they don't repel magnets much at all, since they are not conductive. The eddy currents carry their own magnetic field, which is in opposition to the permanent magnet. These two fields repel each other, hence the levitation effect. It is really fun to see - you've got to build one!